I made Taos Candle Sticks on the potter’s wheel. Their shape reminds me of mid-century modern design, which I grew up with and love. Taos Candle Sticks accommodate the straight, classic, 7/8″ dinner candle. You might prefer the 7/8″ candle that is tapered at the end. The pair will come with ferules set into the holes with hot wax. 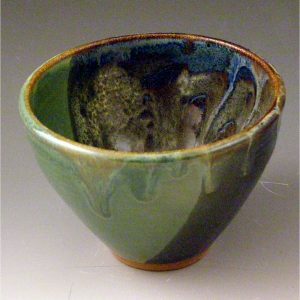 This will accommodate the tapered en 7/8″ candle, which seem to be more common. You may pop these out and go for the wider based candles. I like to have choices. 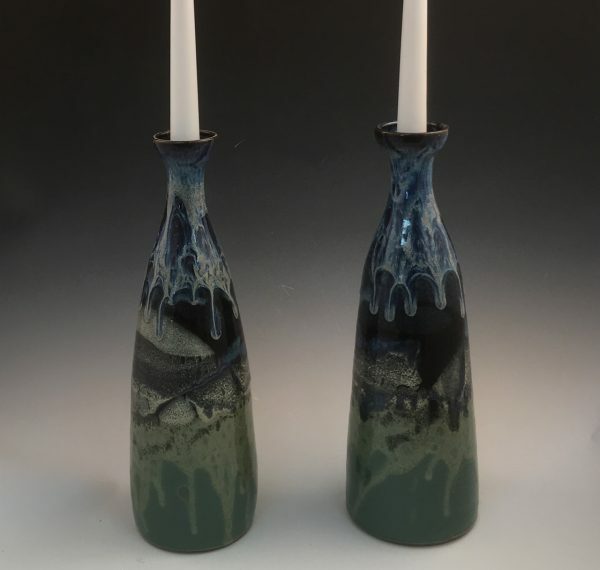 I dipped the top of each candle stick in a floating blue glaze that I mix. Then I dip the bottom 1/4 of each candle stick in a green glaze I make. 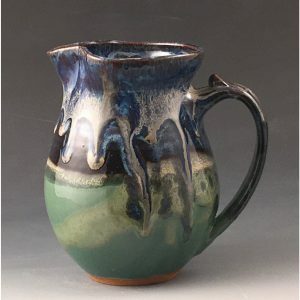 I drip trail a cream across the seam of the first two glazes. And lastly, I dip the top of each candle stick in red gold glaze. 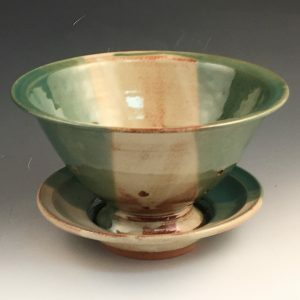 The melding of these 4 elements creates a dynamic surface, reminiscent of Northern New Mexico. Set off your table with this simply stunning duo. Frame a special bowl or vase on your dining table. Accent a side board, hallway, or entryway. Sold as a pair. Each 13″ high. Pair of gold-toned ferules included.